SO i don't know if you girls know this or not but I was once a sorority girl back in the day. I was a Gamma Phi Beta & proud of it! It was a lot of fun...my favorite part being the formals of course. SO with that all said & tweeted I am so excited to be teaming up with Chelsee from Southern Beauty Guide, Amanda from Rhyme & Ribbons, and Kristyn from Carolina Fireflies to bring you a one-time link-up! 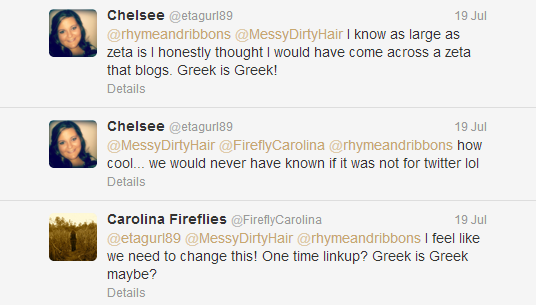 So "GET EXCITED LADIES" for the Greek is Greek Link-up! We will all be linking up on Wednesday, August 7th and hope that you all will join us!! 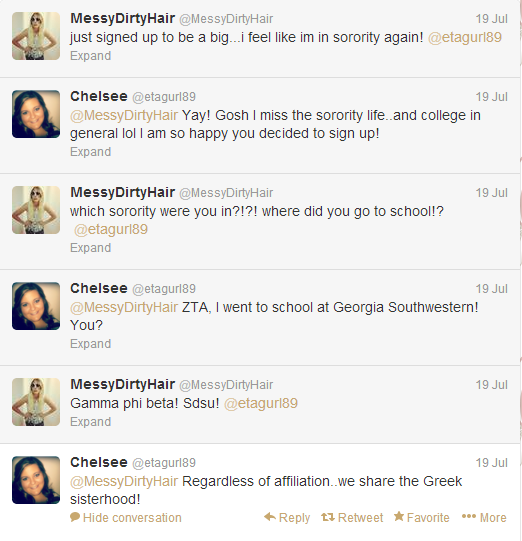 If you were greek, tell us about it! We want to meet you! If you weren't greek, tell us about some greek experience you had - a fraternity formal you went on, maintaining a relationship with your best friend that was in a sorority, how happy you were that you didn't join a sorority, whatever you want! So dig up those old sorority photos...can't wait to show you mine...& get your post ready, grab a button, and link-up with us on August 7th! Will you be joining us for Greek is Greek??! & don't forget the last round of #TheMessyProject for July is WEDNESDAY....be ready to be blown away, again!! SO excited for this! OH HEY ZTA!! So excited for a Greek Link up! 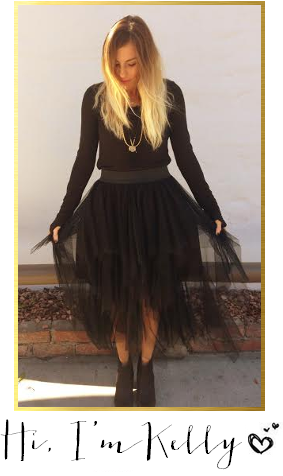 This APhi will be signing in! So fun! I am in D Phi E! I'm a Gamma Phi too!!! I've been reading you for forever and didn't realize that how exciting :) I can't wait for the link up! You were a Gphi sdsu?! I was a fall05! Small world! I am ridiculously excited for this link up! I love meeting other Sorority ladies :) I hope another Phi Mu links up, I haven't found one yet! 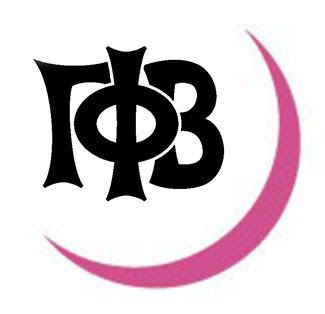 I so wanted to be in gamma phi beta at my school. sad to say they didn't want me! We did not have sorority's at my school and I really feel like I missed out! I was never in a sorority but this looks like so much fun!!!! excellent idea! This Alpha Gam is excited to join! My post is ready to go! So ready for this link up!! I was a gamma phi, too! I can't wait to link up :) But is it Wednesday the 7th? Or today? !